Last year, we posted a list of the top 10 XBLA soundtracks and while it’s a great list, there’s been a great deal of omissions and new tunes in the past year. Some of them have become iconic and immediately hummable or in some cases, incredibly dance-y. So we’re bringing you another 10 to add to the list, in no particular order since they’re all winners. It might be cheating a little since it technically came out in 2010 on the PC, but it’s on XBLA this year so it’s a part of this list. The theme to the town offers a settling view on things but not without sounding a little lethargic. The hints of string offer a bit more vibrancy and depth to this little town. While the dungeons sound desolate and filled with cries of monsters, let the soothing nature of Torchlight calm you down from dungeon crawling. I love you, Meat Boy. I love you Team Meat. It’s no secret that I’m pretty much in love with this game and the music sounds not only contemporary but incredibly retro at the same time. You can imagine platforming to this music for minutes, hours, days while feeling the dance, moving your feet while trying not to die. While some staffers aren’t as fond of the game (because they’re babies) but there’s no doubt that the music is incredible. Call it overhyped or call it classic, there’s no doubt Bastion made an impact in the downloadable game market. It begins with a simple acoustic guitar that builds up until the crescendo gets bigger and bigger. The more strings, it’s almost like the sun is rising and you’re ready for an adventure. This music makes as much of an impact as it will make the Kid wake up. This game sparked the tradition of adding crazy songs throughout the story and end of Twisted Pixel games. Donuts, Go Nuts! is simple tune: everybody loves donuts so let’s just eat one or two. The rest kind of explains itself. Just listen, it’ll tell you what you need to know. Our Podcast Producer wasn’t a fan of this game but he did cherish the music. If you want something that combines the symphonic nature of Castlevania with Dragon Ball Z guitars, this is your best bet. It sounds as gothic as it does blood-ridden, with death-defying guitars and piano all over. Whips won’t save you now, better use the blades attached to your wrists to bring the pain. So you’re probably asking yourself “why wasn’t this here last year?” but now let us gush about it. The minute you’re out of that castle, the synths blow up and you’re ready to fight as many enemies with your weapons and magic. But that’s only the start, later it on it gets even more dancy and it gets intense when you realize you have to kill each other for a princess. Every song in this game gets the mood right, even three years after its release. What’s one thing that makes Pac-Man better? A faster pace, hundreds of ghosts and dance music. Yeah three things, deal with it. The pace of the music goes amazing since you’ll want to react so fast and bopping your head eating pellets. The ghost train happens soon behind you and once you get that power pellet, backwards you go as the breakdown in the song hits. You ranked up over a million points on that move, thank the beat and your hands. Again, you might claim this as cheating since it’s from 1992 but seeing how it was only released in arcades, we feel it needs a place as random and as crazy as this music is. If you enjoy Turtles in Time’s music, you’ll find this as a no-brainer of great beat-em up’ music. The best part of the Junk Factory music is that the lyrics are just “X-X-X-X-Men!” and “C’mon!”. It just sounds like great 90s tunes and a time portal with Magneto welcoming you to die. Orcs Must Die! is a well-loved title by the XBLAFans staff and the music adds to the experience. It combines the blistering guitars with symphony strings like Bloodrayne: Betrayal but does it way better and not just because it’s a better game. It effectively pumps you up when the next onslaught of orcs is about to strike. Make sure the traps are set while the strings die down, the guitars will rock out as those pesky orcs fall into your traps. This might be the best soundtrack for any game but that’s a ridiculous claim and it’s hard to think if it can get any more perfect than this. Ubisoft brought in Anamanaguchi to record all the music for this beat-em’ up based on the Scott Pilgrim license. If you’ve ever wanted something to sound immediately like it’s coming out of your NES, this is that soundtrack. Practically anything in the game has a theme from the shop music to the world map screen. The soundtrack not only sounds retro but it sounds ultimately modern which almost makes it timeless. 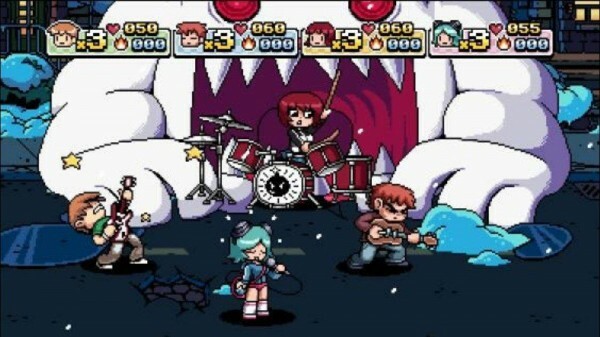 Some levels sound like Double Dragon while some sound like Mega Man but at the end of the day, it sounds like a culmination of everything we loved as a kid raised on video games and comics, just like Scott Pilgrim. There are probably plenty more soundtracks where that came from and who knows what we’ll see next in the XBLA world. From symphonic strings to speed-metal, there’s a lot of great soundtracks and songs from the games on your digital shelf. Let us know what favorites we missed on this list in the comments below and tell us what’s your favorite XBLA soundtrack?